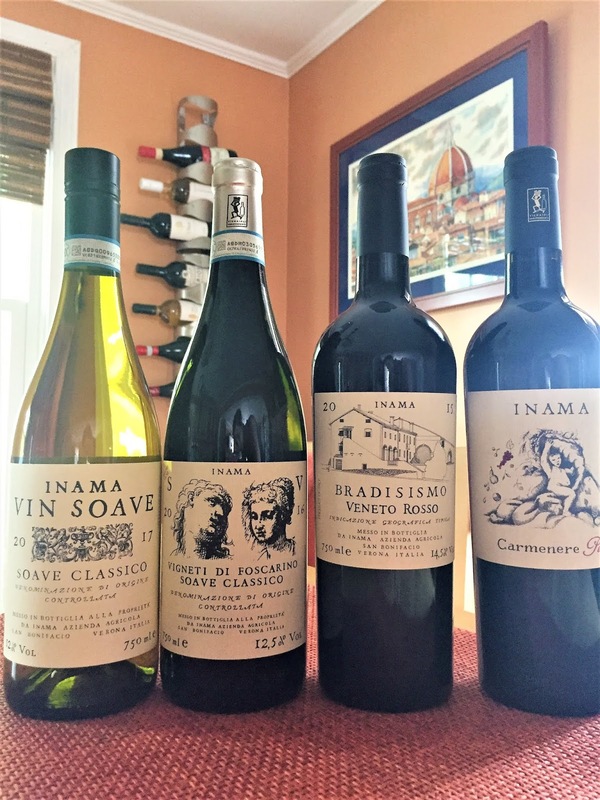 The Inama winery, a known name in the Soave wine region of the Veneto, was started back in the 60's by Giuseppe Inama. 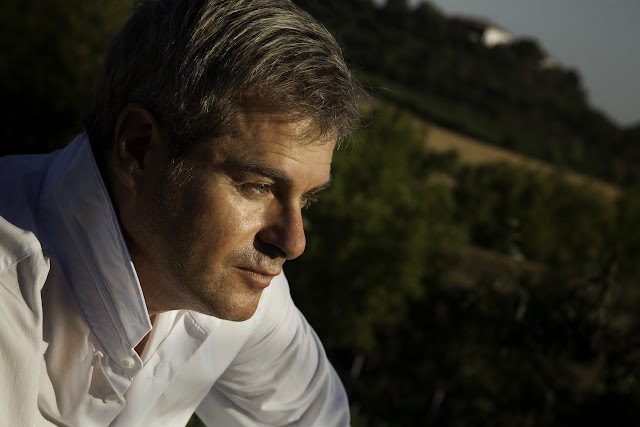 His vision was to produce all high quality wines from old vine garganega, the primary grape used in the wines of Soave. Today the winery is run by 3rd generation, Stefano Inama, Giuseppe's son. The vineyards of Inama are located in the Veneto region in the northeastern part of Italy between the major towns of Verona and Vicenza. It's a wonderful region with so many beautiful towns explore including the former two mentioned as well as Padua,Venice and more. Inama's white wines hail from the historical Soave Classico wine region and the reds coming from the Colli Berici, just south of Vicenza. I actually learned something interesting from Inama's site that the name garganega was transformed in local dialect from the Grecian wine grape, Graecanicum, that was initially planted there. 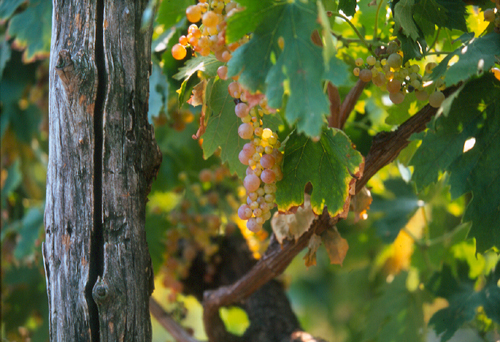 The wines of soave are either primarily made from the garganega grape or some may be blends. 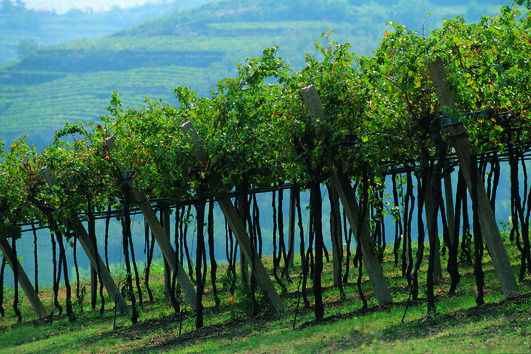 Giuseppe bought plots of land in the Soave Classico area, the historical part of the wine region where the soils are made from volcanic soils stated on the Inama site to be over 30 million years old. Their single vineyard Soave wine, Monte Foscarino, contains a blend of soils including red clay, basaltic lava and volcanic tuffs. 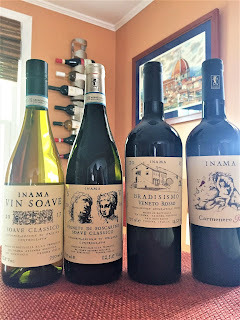 These types of soils tend to lend complexity and minerality to the wines.Below are the wines I tried from Inama with my standouts being the 2016 Inama Vigneti di Foscarino Soave Classico and the 2015 Inama Carmenere Piu Veneto Rosso. Inama's entry level soave wine. Made from 100% garganega on 30 year old vines the wine is vinified in stainless steel. This wine makes up about half of Inama's production. An easy drinking wine with medium body, fresh acidity combined with apple and tropical notes and a bit of creaminess to the texture. Food pairings: Inama recommends risotto, white fish, sushi, local fresh ricotta and stewed peas. The single vineyard, old-vine soave wine from Inama. A wine with much complexity made of 100% garganega and fermented in used barriques. The wine is aged on the lees stirred every 6 weeks for 6 months and fining takes place for 6 months in stainless steel. A creamy texture with more notes of pears and hone. A blend of 70% cabernet sauvignon and 30% carmenere. This wine spends 15 months in a mix of 50%/50% used & new barriques. A full-bodied wine rich in blackberries, cherries with some pepper. A rather smooth wine with low to moderate tannins and good acidity. The label signifies the house where he Inama family lives that was built back in the 1700's. Food pairings: Inama suggests bbq, filet, stews. Local specialties include bigoli with sausage and asiago cheese, grilled bone-in rib eye and bean soups. A blend of 70% carmenere and 30% merlot. Another wine rich in dark berries with chocolate notes, pepper and spice (and everything nice). The wine spends 12 months in used barriques. A unique wine, especially to see this grape dominate the blend. * Most pictures copyright of Inama winery and these wines were provided as samples, but opinions are my own. 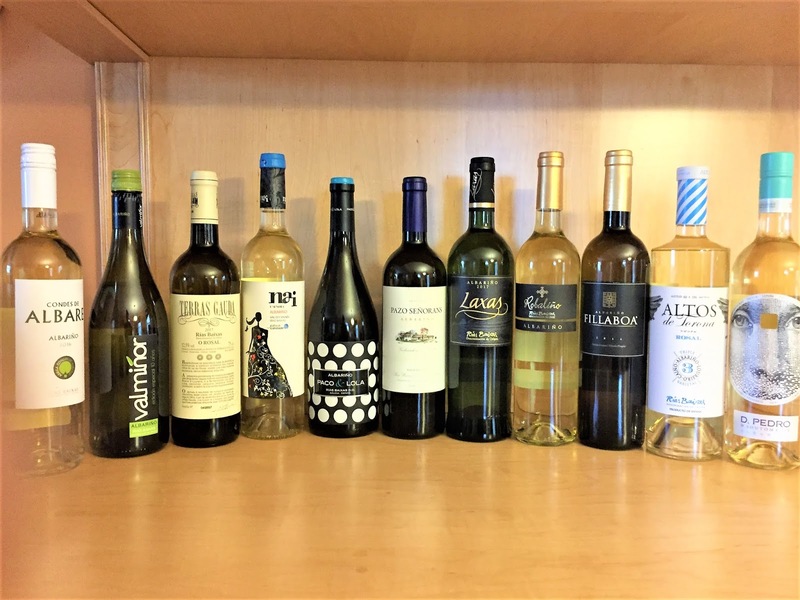 A little behind on the game I am as I just completed our family move to New Hampshire and this virtual tasting I attended with Snooth was back in May, but the wines (and my notes) are fresh in my mind highlighting the white wines, specifically albarino, of Rias Baixas in Spain. The tasting was led by Mark, co-founder of Snooth, and James Beard award winning wine and food writer, Lyn Farmer. The wine region of Rias Baixas is located in Galicia in the northwestern part of Spain and it’s wine production is 90% dominated by the refreshing grape, albarino. A rather cool region with the summer only averaging about 60 degrees. Within Rias Baixas are 5 sub-regions and in the tasting of 11 albarino wines we covered 3 of them including Val do Salnés, Condado do Tea and O Rosal. The other 2 not covered here today are Soutomaior and Ribeira do Ulla. Interesting fact of the region is that more than half of the winemakers are women. Women power! A winery founded only 20 years ago located in a very wet province. A crisp wine with citrus qualities and good body and acidity combined with nice minerality. The minerality and saltiness seemed to be a consistent characteristic in the tasting. One of the 1st wineries in Rias Baixas. Located right on the river with vinho verde being grown on the other side. 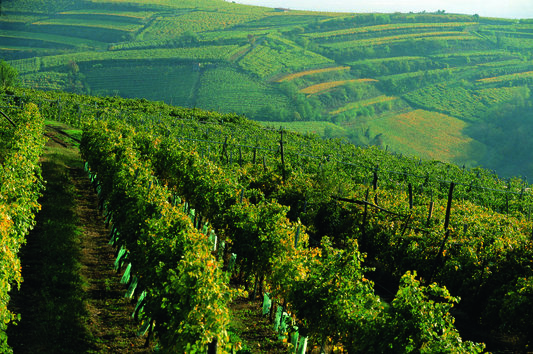 There are lots of terraced vineyards. A fresh wine showing notes of stone fruit and citrus and is rather well balanced. Soutomaior is the smallest of the 5 subzones, but this wine actually hails from the Condado do Tea subregion. Named after a hero of the 16th century, Don Pedro. Good citrus, acidity (looking like a trend here) with plenty of salinity. Nice and clean. For those that are lovers of ratings this wine was rated as #35 on the Top 100 Wine Entusiast list in 2017. A wine aged on the lees for 5 months creating a rather soft, creamy wine with tropical notes. A wine with good acidity and grassy notes combined with herbs. This wine is produced from a collective of 105 partners combining traditional and modern values in winemaking. A bright wine with with notes of melon. This winery is located along the coast and produces a clearn wine with bright acidty that is like biting into a crisp, green apple. A wine with is a tribute to women. An aromatic nose with zesty acidity, salinity and lots of citrus. This wine hails from one of the oldest farms in Galicia. A wine produced on the lees creating a richer, silky texture. Notes of tropical fruits with a little spice. This wine is produced from a cooperative made up of 400 members. A fresh, easy drinking wine with notes of lemon and citrus. Quoted as a wine good for those that like sauvignon blanc, but looking for something different. Made up of some pretty unique grapes including 70% albarino, 15% loureiro and 15% caino. A wine with depth, creaminess and some stone fruit. If you haven’t tried albarino hopefully this is driving your motivation to grab a bottle this weekend. If you have already tried albarino what did you think and have you tried any of these wines yet? *All wines provided as samples, but opinions are my own. I'm obviously a huge fan of Italian wines, but I love finding Italian grapes grown outside Italy to experience the difference of the grapes being grown on non-Italian soil. This month our Italian Food, Wine & Travel group is doing just that in sharing wineries around the world producing wines from Italian grapes. We've talked about primitivo here in the past and it's a grape that you'll typically find in Puglia, but today I found one out in Lodi, CA from the Harney Lane Winery. I was introduced to the Harney Lane Winery awhile back when I tried their 2012 Lizzy James Old Vine Zinfandel. Harney Lane and the family have been harvesting grapes for 5 generations. The winemaking there is carefully tended to with everything done by hand. I connected with owner, Jorja Lerner, to get a better understanding regarding their Primitivo Lot wines. Jorja actually held a career as a physical therapist for 15 years, but growing up having respect for farming she got her calling back to the family winery and today runs the tasting room and operations. Can you give me your history in the wine industry and what got you started with Harney Lane? For 5 generations my family has grown wine grapes on the Harney Lane property. In the early 2000's my husband and I started discussing the thought of a winery as well as other options as a way to add value to the family farm to ensure it was financially viable for generations to come. Our region has long been the backbone of the California wine industry, but at that point few families had developed their own label. In 2006, we made our first vintage of wine, jumping to the vintner side of the busienss and we never regretted the decision. It is more work than we ever imagined but also more rewarding. While it has added value to our business it has also been a beneficial learning tool for our farming practices and gratifying to share our final estate product directly with the consumer. What attracted Harney Lane to producing primitivo in particular out of all the Italian native grapes? Were other Italian grapes considered? Primitivo really comes also as a circumstance of our farming history. We had already been growing this variety for another large winery. As a grower, it is more elongated and slightly earlier ripening than many zinfandel clones. As a grower it made sense to reduce some of the struggles growing zinfandel. Early in our winemaking, we quickly discovered that primitivo produces beautiful, elegant dark cherry notes that are distinct. It completely made sense to share this with our consumers as another offering in our lineup. The Harney Lane Primitivo Lot is a club exclusive wine so I was lucky to receive a sample. They blend 3 vintages producing a wine that full bodied, robust and in jammy berries and vanilla with a hint of spice. ABV 15.5% SRP $40. Harney Lane recommends the following to pair with this wine: spicy food, thair curry, chicken marsala, sweet baby back ribs, autumn beef stew and cioppino. Join us this Saturday August 4th at 11am EST on Twitter at #ItalianFWT and chat about Italian grapes from around the world. Next month on Saturday September 1st we will be featuring Fall Reds. Camilla of The Culinary Adventures of Camilla features "Italian Grapes in Paso Robles: Aglianico, Malvasia Bianca and Some Pairings"
Jeff from Food Wine Click shares "Eating Pizza / NotPizza with ITalian / NotItalian Wines"
Lynn from Savor the Harvest shares "This Italian Wine Grape Fooled You"
Susannah from Avvinare shares "Noteworthy New York State Wines Made with Italian Grapes"
Gwendolyn from the Wine Predator features "An Italian in AUS? Meet a 2006 Montepulciano from Tscharke"
Lauren at The Swirling Dervish is featuring "Ryme Cellars Ribolla Gialla: A Taste of Friuli in Napa Valley"
As we all know understanding wine around the world can be challenging to get a grasp on especially if we haven't visited the region, don't understand the language nor the wine laws that come along with each wine territory. When it comes to Italian wines the real challenge is that Italy alone has over 2,000 native grape varieties. That's enough to make your head spin. Our Italian Food, Wine & Travel group this month is taking these Italian grapes to another level by finding countries around the world outside of Italy that are growing some of these Italian grapes on their own soil. 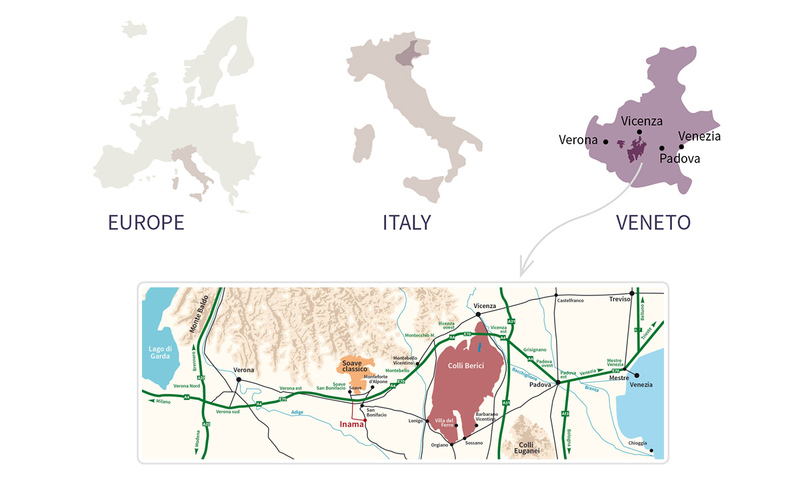 What types of wines do they produce on different soil, with different climates and how do they compare to those that are grown in Italy? There is lots to share and our group this month will shed some light on the variety to be discovered. Join us this Saturday August 4th at 11am EST on Twitter at #ItalianFWT and chat about Italian grapes from around the world. Lauren from The Swirling Dervish features "Ryme Cellars Ribolla Gialla: A Taste of Friuli in Napa Valley"
Gwendolyn from the Art Predator features "An Italian in AUS? Meet a 2006 Montepulciano from Tscharke"
I'll be featuring from Vino Travels "Italian Grapes in Lodi with Harney Lane's Primitivo"